Basoda festival is dedicated to Goddess Sheetala and is observed eight days after Holi festival on the Chaitra Krishna Paksha Ashtami day in Rajasthan and other parts of North India. Basoda Festival 2019 date is March 28. The ritual observed on the eight day of waxing phase of moon in Chaitra month (March – April) is also referred as Basora. During Basoda Festival, Goddess Sheetala is propitiated to get rid of several diseases like chicken pox. A unique ritual of offering stale food is observed during Sheetala Ashtami. Food need for Sheetala Ashtami puja is prepared a day before in advance. On the Basoda Festival day people do not cook any food. The food is prepared the previous day and it is then allowed to cool down. On the Basoda festival day, the food is first offered to Goddess Sitala. Every house chooses a special stone which symbolises Goddess Sitala. The stone is then installed on a red cloth and worshipped with diya, incense, flowers, kum kum, water, yoghurt, wheat and henna. An aarti is performed and mantras dedicated to the goddess are chanted. The food prepared on the previous day is then offered to the Goddess and it is then consumed by people as Prasad from Goddess Sitala. The rituals associated with Goddess Sheetala is observed on Ashtami day - the eighth day during the waning or waxing phase of moon in Phalgun, Chaitra, Vaishakh, Jyeshta and Shravan months. The most important is the one observed during the Chaitra Krishna Paksha Ashtami or the eighth day during the waxing phase of moon. 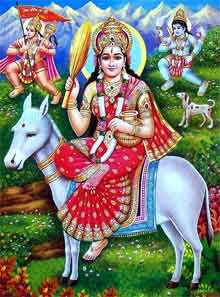 She is also worshipped on Sashti (sixth) and Saptami (seventh) day of a lunar fortnight. Goddess Sheetala is the Goddess who cures various pox and skin diseases. She is propitiated for protecting children. You can read about the origin of Goddess Sheetala here. Goddess Oladevi or Olabibi - This is a Goddess Similar to Goddess Sheetala and she is worshipped in Bengal. You can read about Goddess Oladevi here. Sheetala Mata Puja Vidhi – How to do or perform Goddess Sitala Mata Puja?